In the San Antonio Real Estate Market, it’s always a good idea to look at your options and see what will help you effectively reach your goals with the sale of your house. While you may be able to get a bigger “gross sales price” when listing with a local San Antonio agent, that doesn’t always turn out to be more money in your pocket or less stress and hassle. We’ve broken down the details below so that you can compare your options. 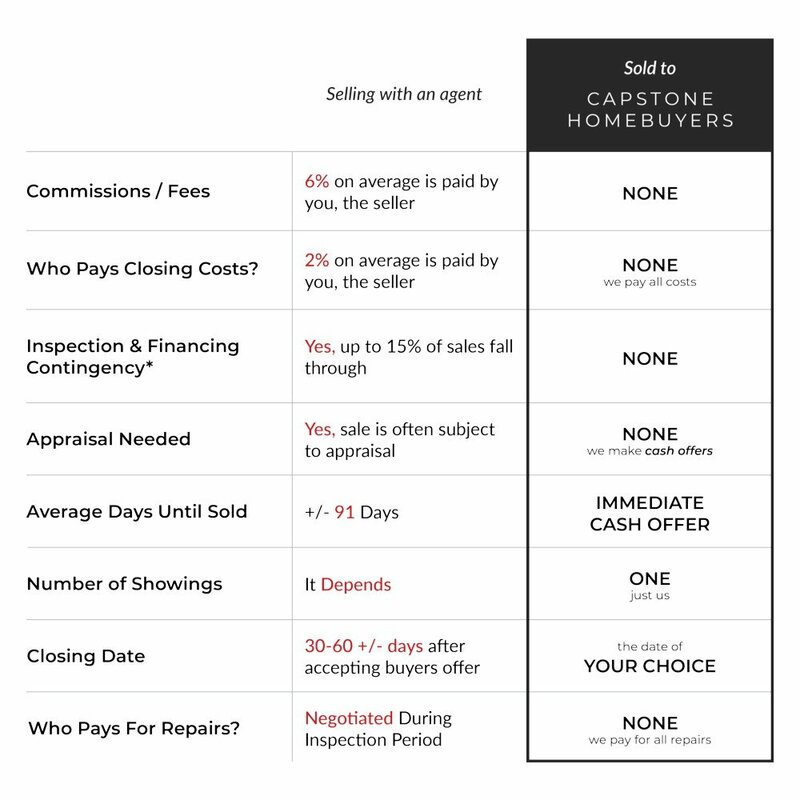 When you look closely at the numbers, the picture becomes clear regarding the benefits that each method of selling your San antonio house offers. At Capstone Homebuyers we know our offer isn’t 100% of the full market value for your house… but we also offer other benefits that going the traditional house sale route doesn’t offer. We seriously don’t care if the house has needed cleaning for years! (Trust me…there’s worse out there and we’ve bought those too) or if there’s a laundry list of required repairs (think it might be a complete gut job? We buy those too!)... we want to get your a fair, all-cash offer for your house. We are confident we will save you time and money and you will love our house buying process. 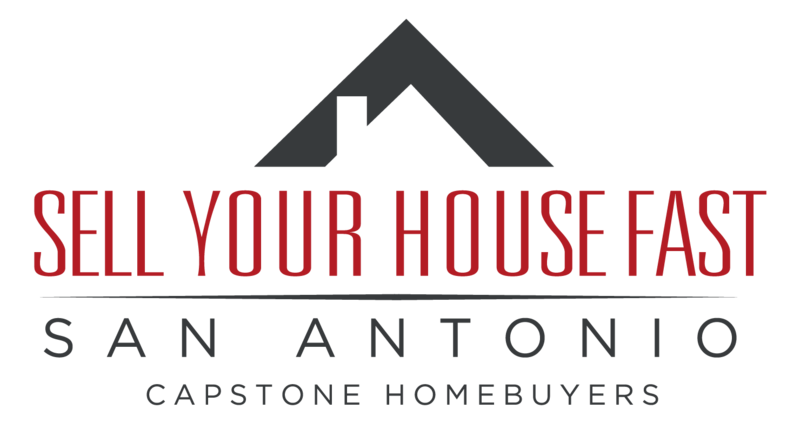 Capstone Homebuyers is a local, San Antonio Home Buying Company, and because of this we make it easy for you. We have a good understanding of what the closing costs will be so we just cover them to simplify things for you. Our fair, cash offer is designed so that you know how much you will be getting from the sale of your house (with the exception of any mortgage and county property taxes ). Sound Amazing? We we think so and so do all those who have worked with us in the past! So when you add up the time you could save by working with Capstone Homebuyers, the no-hassle experience, and the money you’ll save on commissions, fees, and holding costs while you wait to sell the traditional route… for many area home owners selling us is the best viable option. Find out what a fair, no obligation all-cash offer on your house looks like and how great we are to work with today. You can send us your info in the form below or just give us a call at (210) 793-4448 and let’s talk! Our process is simple and you can close on the date of your choice. You have nothing to lose by getting an offer (no obligations – no pressure). But you could potentially lose thousands of dollars or months of your time by not testing us out and requesting your FREE house offer below. Here at Capstone Homebuyers we don’t use bank financing so you don’t have to worry about our ability to close on a deal.